An inspired spell of fast bowling from Stuart Broad catapulted England to a 74-run win over Australia in the fourth Test and sealed victory in the Ashes series. Chasing 299 for victory, Australia were well placed on 168-2 but lost their next eight wickets for 56 runs as they collapsed to 224 all out. Tim Bresnan turned the tide when he had opener David Warner caught behind for 71 and Broad followed up with a devastating burst of 6-20 in 45 balls to finish with 11 wickets in the match. A breathless and barely believable evening session, in which nine wickets fell, ended in fading light at 1940 BST when Broad had Peter Siddle caught at mid-off to put England 3-0 up in the series with one match to play. Amazingly, less than two hours before the final wicket fell, it appeared far more likely that Australia would be heading to The Oval on 21 August with a chance of levelling the series. The tourists made the ideal start to their run chase as Warner and Chris Rogers put on 109 for the first wicket - Australia's first century opening partnership in the Ashes since The Oval in 2005. Rogers eventually fell one short of a half-century - caught by Jonathan Trott at slip off Swann - but even when the off-spinner followed up with the wicket of Usman Khawaja for 21, there was little sign of the madness that followed. The turning point arrived when Bresnan produced a superb delivery to remove the dangerous Warner, who was drawn into pushing at a ball angled across him and got a thin nick through to Matt Prior. Sensing their opportunity, England pounced in ruthless fashion. Broad sent captain Michael Clarke's off stump cart-wheeling before Steve Smith bottom-edged a pull on to his stumps. Roared on by the England supporters in the Chester-le-Street crowd, Bresnan trapped Shane Watson in front to leave Australia in disarray. Broad, bowling as quickly and aggressively as at any time in his career, then had Brad Haddin and Ryan Harris lbw before bowling Nathan Lyon. With just one wicket needed, England were granted an extra half-hour but, with the light fading, the umpires insisted on them bowling spinners from both ends. Six overs came and went without any great alarm before the reappearance of the setting sun gave Alastair Cook the opportunity to go back to his pacemen. Six balls from James Anderson failed to deliver the breakthrough but, when Broad returned from the Lumley End, it took him only three to induce a false stroke from Siddle and send the crowd into raptures. Broad's match figures of 11-121 were the finest of his career and the best by an England bowler in the Ashes since Phil Tufnell's 11-93 at The Oval in 1997. 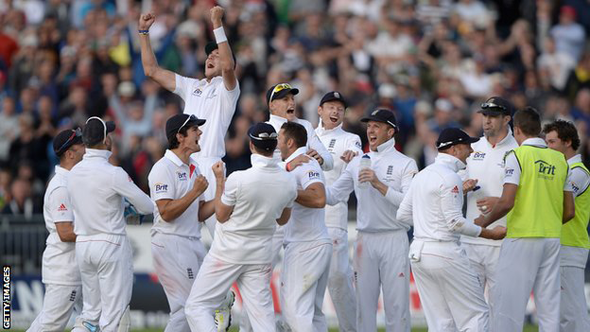 Earlier, Australia took England's last five wickets for 96 runs to bowl them out for 330, with Harris claiming 7-117. The outstanding fast bowler, whose omission from the first Test is beginning to look like a glaring oversight, bowled centurion Ian Bell and Prior with successive balls and ended a brief cameo of 13 from Broad with a brutal bouncer that he gloved to gully. Bresnan, who made 45, and Swann fought back with a crucial attacking partnership of 42 and, by the time Anderson was last man out, England had pushed their lead to within two runs of 300. Even then, for long periods of the day it looked as if Australia would pull off a famous chase with something to spare. But when Broad and Bresnan found their stride in the evening session, England were irresistible.